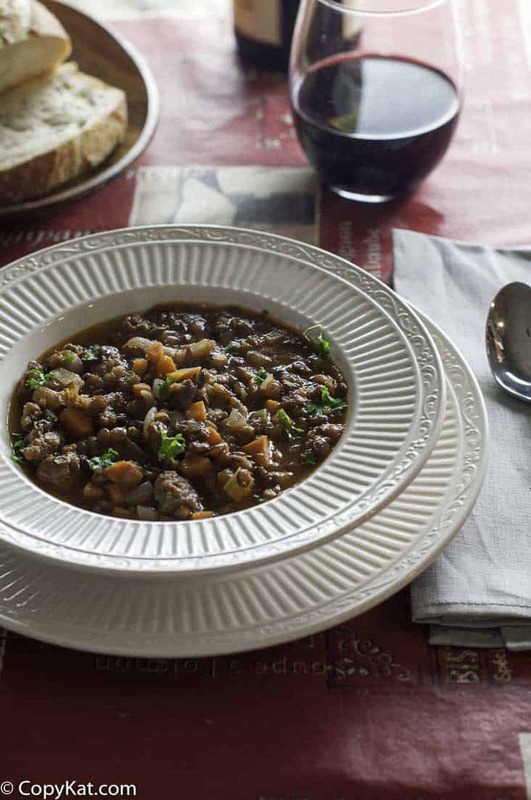 Carrabba’s Sausage and Lentil Soup is a delicious and hearty soup you can make. One bite, and you will fall in love with this simple soup. I love getting recipe requests from people like yourself. This way I get to try new recipes all of the time. This recipe had been asked by several readers of CopyKat.com. Sausage and lentil soup have the benefit of being an inexpensive soup to prepare and it is hearty. I love soups like this they are filling, and they reheat well. This Carrabba’s Sausage and Lentil soup tastes even better the second day. Carrabba’s makes everything up fresh for you. If you get the right table, you can watch them prepare your dinner right in front of you. You know your meal is going to taste very well when you look at the cooks there prepare your food with fresh ingredients. This sausage and lentil soup are very easy to make. You don’t need to buy exotic ingredients. This soup is made with Italian sausage, onions, carrots, celery, chicken stock, and a little love on your part. You can put this soup together in about 90 minutes from start to finish. I know you are going to love this soup. If you want to make this soup a little lighter, you can use Turkey Italian sausage. The Italian sausage is the most critical flavor of the soup. I suggest that you get the kind that you like the best. The type with a thick fennel flavor are the best ones to get. When starting out this soup I like to saute all of my vegetables before I add in the meat, I think makes the vegetables caramelize a little more and gives them additional flavor. You should cook this in a slow cooker if you wanted once you get the sausage browned. Love restaurant style soups? Be sure to check out some of these. 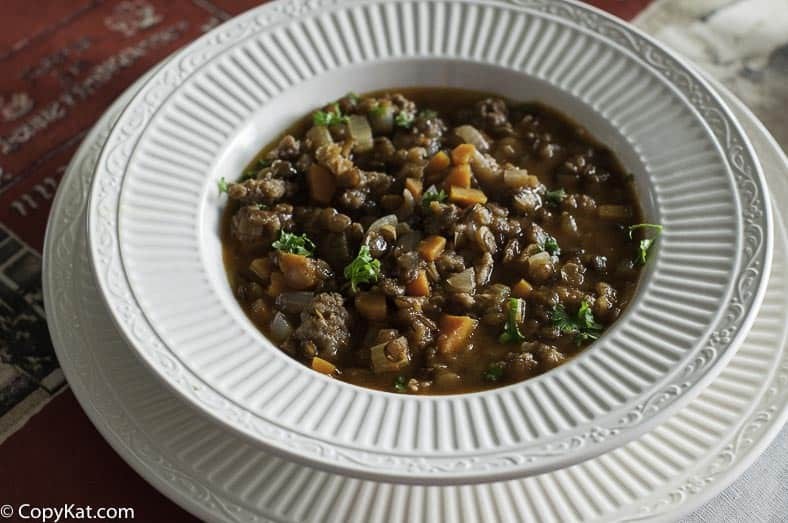 Carrabba's Sausage and Lentil Soup is so easy to make at home. In a large pot add onions, carrots, garlic, and celery and either butter or vegetable oil. Saute until the onions are transparent. Add sausage, and cook until browned. If the sausage is fairly lean drain the excess oil.Add chicken broth, Italian seasoning, diced tomatoes and brown lentils. Cover with lid. And simmer for about 1 hour. You may want to add some additional water if too much water cooks out during the cooking process. I would do 4 to 6 hours on low in a crockpot after you brown the sausage. I didn’t use them, but added a fat shot of L&P Worcestershire. Even still color was off from the restaurant version, very light. I’ve seen references to bacon (regular and Italian) including by yourself Stephanie, but there’s no mention of it in the recipe ingredients. I think it sounds like it would be a nice addition to the soup but where should it be used. When the sausage is cooked? PS- my husband loves the Carrabba version so I’m looking forward to trying this.